In a move that should surprise nobody, the USL has filed suit in Florida against the Tampa Bay Rowdies, Crystal Palace Baltimore, and the Rochester Rhinos for breach of contract. Devo has been told that Rob Clark will be issuing a rebuttal later today. Personally, I wish that the Rhinos would take the "No Comment" approach to this move by the USL and handle things behind closed doors. The USL hinted at this move in their November 20th release in response to Tampa Bay and Crystal Palace Baltimore announcing that they were joining the NASL for the 2010 season. On the surface, it appears that the USL filed this suit ahead of today's deadline set by the US Soccer Federation for more information from the USL & the NASL on their plans for 2010. It will also be interesting to see how FIFA feels about this move by the USL given how hard they came down on a recent lawsuit filed by a club in Chile that was upset with being demoted. FIFA had threatened to bar Chile from participating in next year's World Cup. Would FIFA threaten the US with such a sanction? Or would they just downgrade the US bid to host the 2018 or 2022 World Cup? - Apparently the USL has approached Sevilla FC Puerto Rico about playing in the USL 1st Division in 2010. - This is an interesting take on what the NASL vs USL tug of war could mean to the Canadian spot in the CONCACAF Champions League. - The name, logo, and staff of the NASL team in St Louis was unveiled yesterday. I like the logo, but the Athletic Club St. Louis (aka AC St Louis) is a yawner for me. But, I think the logo and color scheme look sharp. - It was also announced yesterday that St. Louis owner Jeff Cooper is the interim NASL commissioner. - The latest Landon Donovan loan rumor links LD with Everton where he would team up with Tim Howard. - Greg Lalas takes a look at whether the next World Cup champions can come from Africa. - Sudan's national team coach takes a look at Group C.
- Quavas Kirk , who spent the 2009 season in Minnesota, has signed with the Portland Timbers for 2010. - The USWNT blog has an update on Abby Wambach's dog, Kingston. 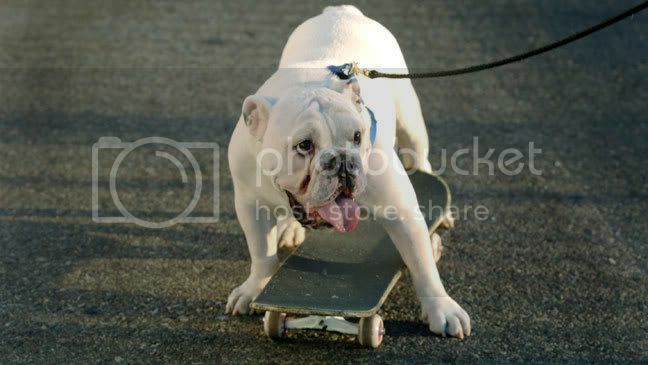 Since Kingston likes skateboarding, perhaps Abby should take him over to The Fantasy Factory to hang out with Meaty and Beefy . - This post from Pitch Invasion had me cracking up. And it's not just players that can get ticked off.